Film & Music, like Film & Food is always an exciting pairing! 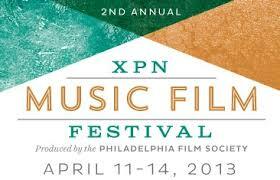 I'm looking forward to attending some of the goings on at this year's XPN Music Film Festival April 11-14, 2013. Here's a link to T&T coverage from last year's XPN inaugural festival. Now in its second year, the WXPN Music Film Festival represents a collaboration between the noncommercial radio station and the Philadelphia Film Society. The event will encompass 17 film screenings, live music performances and a variety of ancillary activities. The eclectic affair will span a variety of music genres, including documentaries about the music scene, biopics about musicians, and movies that have distinctive music soundtracks. Would love to tweet, facebook and foursquare with others attending!